The Polish name for these boots: "Trzewiki ćwiczebne tropikalne wz.920/MON" (i.e. 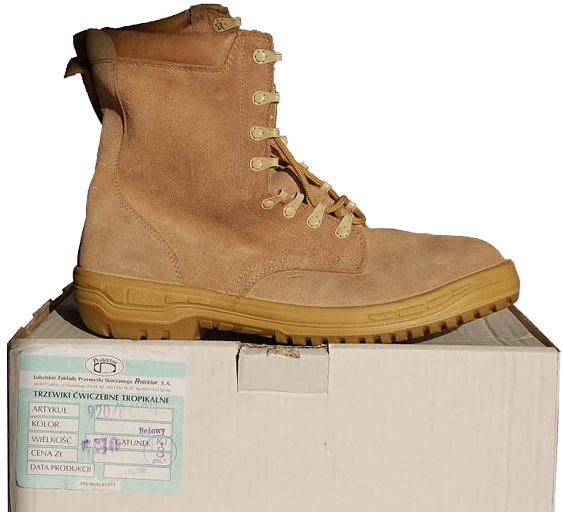 "Tropical training boots Model 920/MON"), or "Trzewiki Pustynne Wz.920P/MON" ("desert" boots Model 920/MON). 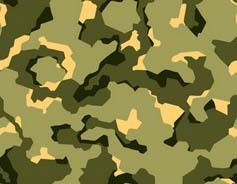 MON (Ministerstwo Obrony Narodowej) is for Ministry of National Defense of Poland. In common practice these desert boots are often called "Szczury" (i.e. "Rats"). 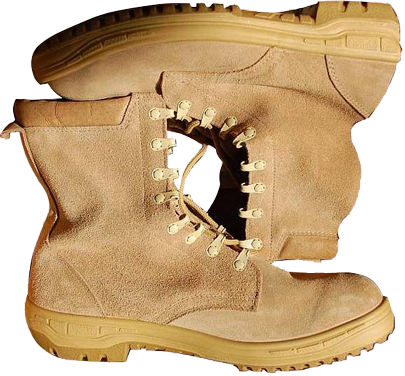 These "desert" boots are very lightweight: a pair of "Rats" boots weighs approximately as a single standard Polish army leather boot. 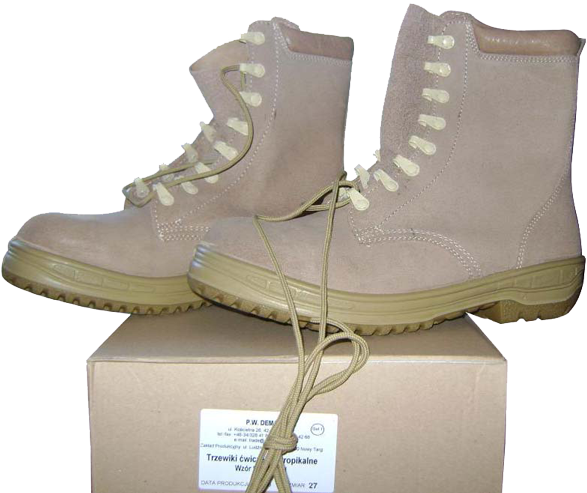 For Polish size 26 a pair of such boots weights about 1400 grams, and by customer experience they are like sports shoes. 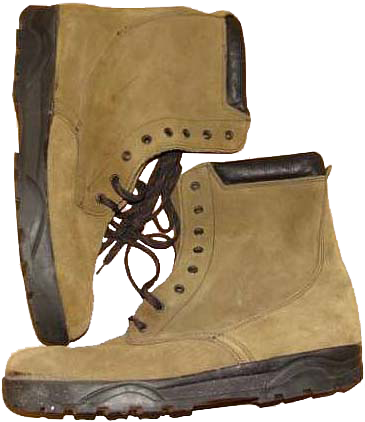 The very early Polish "desert" boots still retained some elements of black colour: the out-sole, the soft leather cushioning on top of the boots and even the laces. 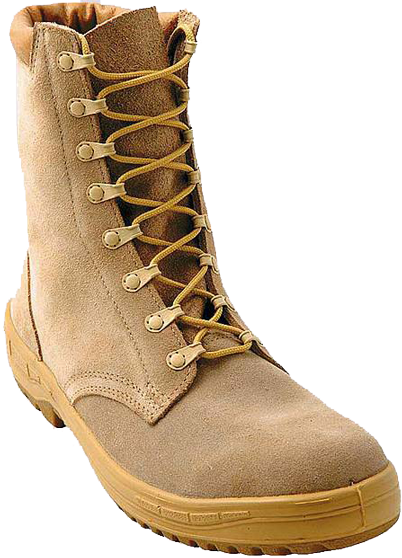 Originally the design of the boots top featured no excessive or complex elements, and even now the Polish "desert" boots are made just from several pieces of suede, the thickness of which is about 1.5 mm. On the one hand, black colour is not needed for the "desert" boots in particular. On the other hand, in the desert conditions the boots very quickly become covered with dust and obtain almost uniform colour. 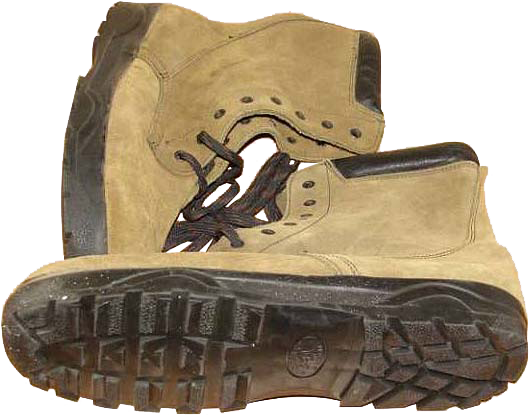 Further on the design of the Polish "desert" boots was improved. The tongue of the boots is sewn quite high, almost to the top of the boots. 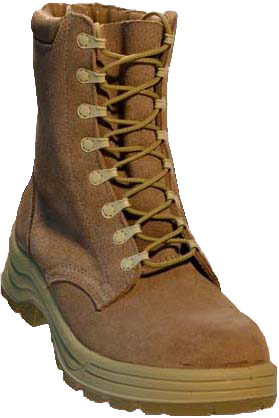 The Polish "desert" boots on the new model (plain sandy coloured), unlike the earlier version, already use speed-lacing system ("systema szybkiego sznurowania" in the Polish language), consisting of eight pairs of identical "MARK" eyelets instead of simple round eyelets. The length of the laces is approximately 1.9 m, for the largest and the smallest size boots the length may vary slightly. 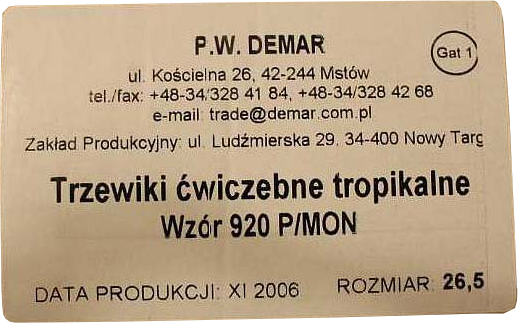 Among the main manufacturers of the Polish "desert" boots are such companies as "Demar" (with production facilities in Nowy Targ city), and "Protektor SA" company of Lublin. One can find the new model of the Polish "desert" boots, featuring the speed-lacing eyelets and the out-sole of old-style black colour. 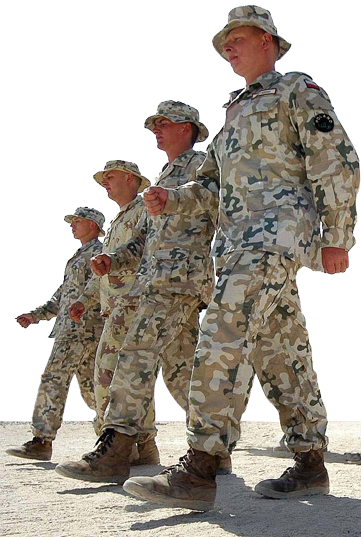 Perhaps, this could be due to the availability of "old stocks" of the out-soles and accessories, used for the production of black light tactical and police boots for the special forces unit "Grom" ("Thunder"), and the urgency of the "desert" boots order.